This 7mm. finescale GWR “Damo B” 20ft. Covered Motor Car Van running number 42230 in weathered grey livery was scratchbuilt & painted by Peter Callon. 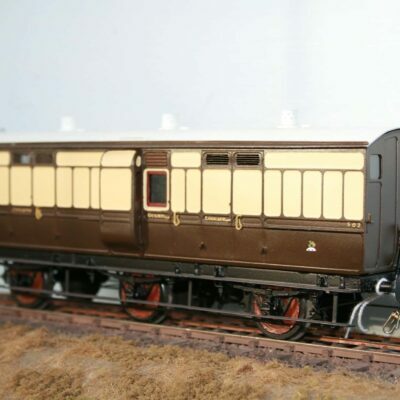 The model is fitted with “Haywood Railway” finescale wheelsets and sprung buffers, “Connoisseur” wheel spring units, “CPL” springs, axleboxes, couplings, vacuum pipes, lamp irons & door hinges, “NMRS” vacuum cylinder, and “Walsall Engineering” underframe parts. The model is finished in GWR 1923-mid 1930s weathered grey livery. Prototypically, this vehicle was built in 1925 to GWR Dia. G25. This new model has a handmade storage box.